On the rainy night of Friday, April 11th, the DaVinci Designer Gallery of Winthrop, Massachusetts, that little spit of land off the near North Shore, collaborated with the Seaport Hotel, near the mouth of the Ted Williams Tunnel across the Boston Harbor in South Boston, on the first of what were to be three events in their springtime art and wine series. “I think we scheduled the three parts of the wine and art series too closely together,” says DaVinci president Maureen Reddy of the difficulty in attracting a large-enough audience, which led her to cancel the second installment in the series, slated for May 9th. “But we’ll have a good crowd at the June 6th event at the Seaport, like we did at the first one,” she continues, not without the indefatigable confidence of a passionate businesswoman. Some seventy spiffy connoisseurs of haughty cuisine and locally fermented visual art paid $125 each to meet the three painters, sole photographer, and lone sculptor invited by Reddy to sell their works at the April 11th event. For that sizeable but not outlandish sum, the clientele, many of them customers of the interior design business that DaVinci mostly consists of, also sampled hors d’oeuvres at the opening reception in the Aura restaurant just off the hotel lobby. They ate a four-course meal (prepared by Aura chef John Merrill) as spare in serving sizes as it was rich in flavor, intensive in labor, and gracious in delivery. And they sipped to their loosened delight, topping it all off and washing it all down, from relatively bottomless glasses of Robert Mondavi wines, one Californian vintage per course. By the time they drifted out of the Seaport’s lobby (furnished with flowers like a funeral home) and hailed cabs back to South Station or (more likely) sped through the Ted back to Marblehead and Winthrop, the rain had not merely picked up a little. It had begun to pour with true abandon, as if from an open faucet. The thirder, secondinstallment of the series, known collectively (and somewhat preciously) as The Collection: Art & Wine Series on the gallery’s Web site, will offer a similar indulgence of the senses to those who call soon. If Reddy’s confidence is any indication, it’s likely to be as successful as the April bash, too. Of course, a promoter’s definition of success may differ from a critic’s or a customer’s. Going by the number of paintings, photographs, and sculptures actually sold at the first eventexactly one: a painting by Debra Freeman Highberger, titled Mammothsome critics and consumers might think the event was a dismal failure. After all, $1,300 of the $1,800 netted that night (after Aura’s overhead) came from the silent auctioning of that paintingand the painting was list-priced at more than double what it went for. But in at least two ways, any gain was a great success. First, there’s the noble cause that the money went to: Massachusetts Advocates for the Arts, Sciences, and Humanities (MAASH), a nonprofit arts-advocacy organization that, among other activities, recently circulated an appeal among likeminded arts supporters for help in getting the state legislature to support a $7.294 million appropriation for the Massachusetts Cultural Council (MCC), which had its budget reduced by 62 percent by Acting Governor Swift for fiscal year 2003. In a literal way, MAASH executive director Dan Hunter’s dry-witted auctioneering was a second sign of the event’s success, especially when he quipped about his original proposal to give the group a name that would spell out SHAM as an acronym. But, to be serious, the second sign of relative success was probably the visibility given to MAASHperhaps followed, in third place, by the visibility given to the five artists at the event. “They deserve the recognition,” says Reddy of the five, “and seventy more people know about them now.” All sorts of seeds, in other words, of crops that might be harvested in the fall were sown at this spring event. One can only imagine what buying power MAASH might have accrued at the April 11th party at the Seaport Hotel if all of the 30 pieces on sale had been sold. Would the state house, seeing the error of its ways and the value of arts funding in a commonwealth that considers itself for fairly good reasons a cultural capital of the United States, have made headlines in the following Sunday’s Boston Globe about its decision to appropriate more for the MCC rather than less? Hardly. But it could have resulted in a slightly firmer nudge to the state representatives and state senators about the importance of arts funding to the Massachusetts economy. After all, the list prices of those pieces add up to some $80,000, which The Rasky/Baerlein Group, MAASH’s newly-hired public affairs advisors, could have put to good use. But the interior design clients of Maureen Reddy must have had their designer homes all outfitted with visual art ever since she came around with her blueprints the first timecorrect? Which would have rendered the likelihood of a purchase from them during the art and wine series somewhat less than promising. They may have been there to have a good time, eat the good food, and contribute a little to a good cause. Which is great, of coursebut one would hope for a broader audience. If the rain didn’t make driving home afterwards difficult enough, the Dazante Pinot Grigio (a white wine from way back in 2001, not too fruity and not too dry) did. That’s what they served at the opening reception in the small gallery space off to the side, where the artists mingled with their potential patrons in the general vicinity of their finished products. 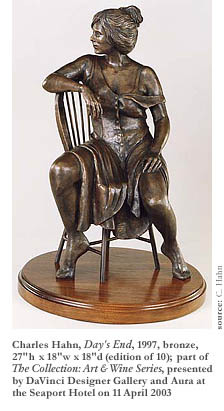 Near his selection of figurative bronze sculptures, including two Degas-like ballerinas and two or three sultry figures (of both genders) turning their torsos in seated poses, stood Charles Hahn, a proud but shy New Jersey native, resident of Melrose, and employee of a sculptors’ foundry in Chelsea, Massachusetts. Reddy was offering most of Hahn’s figure studies for around $3,000, though one, Day’s End, was going for $10,000. Depicting a fully-dressed, ordinary working-woman on a simple chair, the pricey one looked perfect for placement atop the shelf of encyclopedias and atlases in the denand in fact his $3,000 ballerina did attract the attention of a woman who may by now have decided to buy it after all, perhaps reminded of her own childhood dance dreams, or inspired to give it to a young woman in her family. But no one that night put the wine glass down long enough to get the money out for one of Hahn’s sculptures. From his commercial studio in Boston, photographer Lou Jones gets plenty of businesscorporate clients dressing up their annual reports with photos of their banks and whatnotbut he also does an arty photojournalism of sorts. (His studies of death row inmates in Florida have been in the news of late.) But he also does a high-end interior decorator’s photography. Gran Via, a large color photo of downtown Madrid on a neon night, would have looked merely commercial and touristy, with the streetlights of a boulevard drawing us in for a major shopping spree more than a visually exalted experience, if not for the tired faces of people on a bus turning out of the picture to our left in the foreground and taking us with them, in sympathy with their weariness. Jones’ photo of red and white chairs on a deck looked like good bait for a contracted decorator of dentist, travel, and real estate offices, in much the way the waiters’ offerings of more wine and appetizers were bait for the buyers. So did the photo of two men silhouetted on a wharf at night against the fuzzy lights of a cruise shipor maybe the mood-enhancement of a student cafébut the latter photo (taken in Havana) had some character. Still, no one was buyingyet. Probably the two most interesting artists of the five are Debra Freeman Highberger and her husband Jack Highberger. Figurative painters working in series of imagesbeech trees with majestic crowns for her, young female models with nice legs on a couch for himthey both explore familiar territory. Her lusty views straight up the elephant-skinned trunks of beech trees, and into the resolutely crisp green mass of oval leaves in the crown of a single tree, give the complicated dappling more prominence on the picture plane than the wrinkled gray trunk. 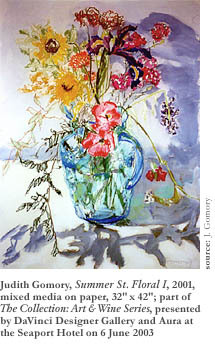 The paintings call to mind the woodland interiors of other painters, including the early-Impressionist Rousseau (Theodore, not the primitivist Henri) and the nature-study watercolors of John Singer Sargent and Winslow Homer. And his fleshy, muscular studies of modelsin subdued, monochromatic shades of brown, tan, blue, or goldremind us of 1980s realist paintings such as those of Philip Perlstein. But both Highbergers bring palpable energy to their canvases. Their borrowed subjects have enough inherent interestgreen foliage lit from above by yellow sunlight, the latent sexuality in the womento keep these works alive. They could both end up being commercially successful (if they aren’t already), if by commercially successful one means a sell to one of the diners at The Collection: Art & Wine Series. It wasn’t quite like being with Baudelaire and Manet at a mid-century soirée in Paris, with the opium-laced green jelly making the rounds and the hashish pipe glowingand Gertrude Stein and Pablo Picasso would have scoffed at the emulation of a salon in her Left Bank apartment. But the winers and diners, including Maureen Reddy’s interior design clients, seemed content just to be out on the town, and the 2001 Pinot Grigio definitely got them in the mood for the next three wines and the successive small servings of food. With the pan-roasted sea scallops over corn off the cob, they sipped an Attems Pinot Grigio (2001); with the Long Island duck leg comfit with Iroquois white polenta, a Pomino Rosso (1997); with the main course of grilled veal tenderloin (with celery root, mashed potatoes, and asparagus tips), Castello Nippoizzano Chianti Ruffina Riserva (1998). Unbelievably, they weren’t served alcohol with dessertno grape-based liqueurs from the Mondavi presses, apparentlybut by that time the bittersweet chocolate strawberry parfait was enough of an inebriant. 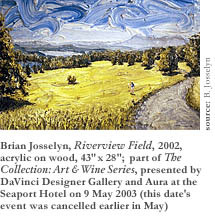 And it’s nice to daydream that proceeds from the June 6th eventfeaturing painters Mark Grundig, Judith Gomory, Joe D’Apice, Gregory Rogers, and Barbara Hadden, plus photographer Paul Weisscould raise $80,000 or so for the benefactor of that evening’s salon: Boston NOW, a program of the Office of Cultural Affairs in Boston that assumes responsibility for the promotion and celebration of cultural activity throughout the neighborhoods of Boston. It won’t matter if it’s raining outside.